We always love featuring our first creations our design team creates with the new collections. These "Launch Party" weeks really make it fun and we get to share with you the opportunity to WIN it as well. We hope you enjoy the new Home for the Holidays Collection like we do. Now you may have remembered seeing peeks of the products in earlier posts like this one, or this one. Here's a few of my favorite things from this collection... but the project below tops them all. GIVEAWAY: And like past "Launch Parties" you can win a box full of the Home for the Holidays Collection by simply sharing the post, any of the projects or Facebook posts. Share on Instagram, Facebook, Twitter, your Blog, Email...oh and we LOVE pins to Pinterest. We'll be watching or you can leave a comment and we will pick some fortunate winners at the end of the week. What better way to start off our Home for the Holiday's Launch party then with a fun Holiday Countdown idea. Creating a small chalkboard is the perfect way to change the date on any darling project and let your kids take the chalk and help you update it each day. Love anything Christmas! Shared on FB. pinned to pinterest, such a wonderful cute collection, has me all festive and warm and fuzzy! Love this collection. Pinned it! I'm so in love with that washi tape. Pinned it and the advent tree! I will pin definitely and share on FB! This is a wonderful collection! I love the green and red shades you guys chose. I love Doodlebug papers, and this collection has to be one of the best ever! Another great collection! Love the tree advent calendar! Looking forward to the projects we'll see the rest of this week! Add to above comment-Have pinned a couple of images too. Love your collections so bright and cheerful!!! Shared on FB, gorgeous projects, love Christmas collection.Thanks for the chance! I love this collection and this project is TOO cute!!! Shared on Facebook. I shared on my Facebook page, I pinned all the adorable pictures I shared with Google and I sent a tweet. I am feeling very tech-wise this morning :) I love this collection and want everything in it. The Doodads, Doodle pops, Sprinkles,Washi tapes,bows and Pixies are so fantastically cute. I just love your style! This is a super fun Christmas project. 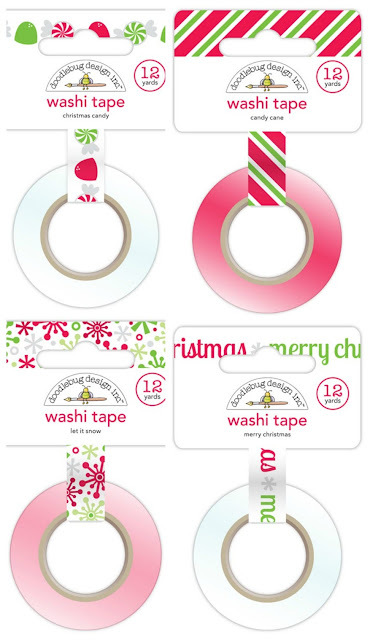 I like the Washi Tape designs. Great work! Super cute project! This line is awesome!!! I saw this line at Archiver's yesterday and I cannot wait to create something super fun with it! Love the bows and tape especially, just wish I had a local supply source. By fast the best Christmas collection ever!! So fun!!! This is so festive and fun!!! Beautiful collection. Love the tree. Johanne L.
Pinned it http://www.pinterest.com/pin/421227371368435594/ Johanne L.
Pinned ya! http://www.pinterest.com/pin/1337074863224908/ love your fun style! Love the project! The collection is absolutely stunning, love the colors! This advent calendar is so stinkin cute - love the idea of the chalkboard circle with the number on it!! Way to go, Doodlebug!! FABULOUS collection and FUN advent!!! This collection is a definite must have! Look at all the goodies! And that advent calendar is superb! I pinned--actually pinned several times! I shared this link on Facebook, love the collection!!! but I do have email---and I've send to all my scrappin friends! I love this line!! I have put it on pintrest and facebook. Would love to win. I love Doodlebug so much!! They never disappoint with their new lines! SO cute!!! I shared this on facebook and I pinned!! Would be so awesome to win. Thanks!! Love the Christmas collection!!! You guys always rock CHristams and Halloween! I look forward to seeing it every year! I just love this Christmas line it makes me so happy to see it! 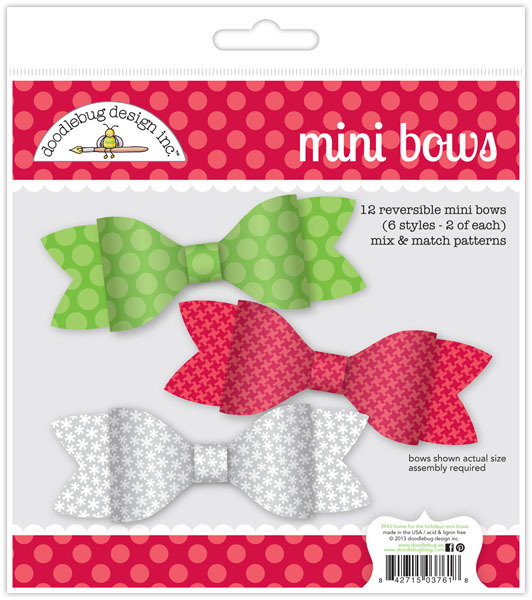 I just love Doodlebug - i would love to win this, because i can't find any doodlebug papers in my area... I love all the bright beautiful colors - this Christmas range is absolutely to die for!!! Super cute and fun idea!!! 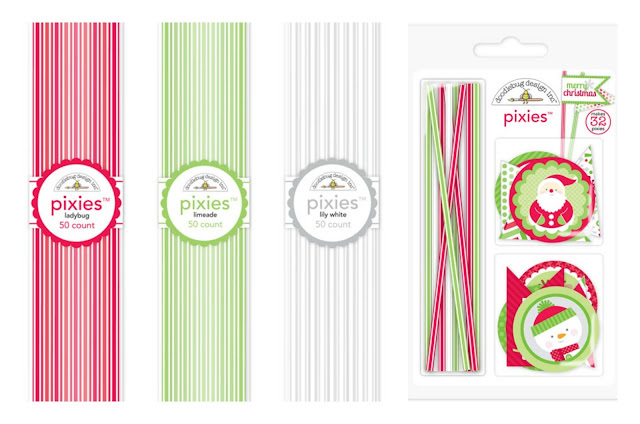 LOVE this fun collection and can think of a million projects to make with it! This collection is SO cute!! I would use this to make layouts and cards, and Christmas gifts!